There are many aspects of religious abuse that still remain in people’s lives long after they have left any given abusive environment. In some ways, we experience the wounds that were inflicted upon us over and over, and we don’t understand why. Because of my journey and the years I have spent in my own recovery process, I can help you identify the features of religious abuse that still may be functioning in your own life. I can take you, step by step, through the different processes I went through to find healing and a healthy, whole life, free from the debilitating beliefs that generate shame and unworthiness. You can create a connection to the spiritual that affirms your unique gifts and celebrates your authentic perception of the Divine. Research shows that the reality of our five sense, and the reality we perceive (whether waking, dreaming, fantasizing or in our subconscious) can all seem just as real to our brains. On this simple basis, guided meditation can have a powerful effect on a person’s life. As I learn some of what your “internal landscape” looks like, we can create an experience together that can help shift beliefs and patterns in your life. Using ritual, imagination and meditation, we can create sacred spaces, monuments and emotional roadmaps in your psyche that help you overcome obstacles that have held you back from the joy and pleasure you desire. If you would have said to me a couple of decades ago that I would be proficient in the skill of reading tarot cards I would have probably laughed in your face (and prayed for you thinking you were possessed by an evil demon). Yet, my spiritual path has taken me to a lot of unexpected places, and using the artful tool of tarot cards to gain spiritual insight has been one of the more beautiful blessings. I got acquainted with them through a radical faerie friend of mine, Stevee Postman, when in the mid-1990’s he designed his very own deck called, The Cosmic Tribe Tarot Deck. Not only did I learn to use the deck while he was painstakingly designed each image, he used me as one of his models in one of the actual cards, #20 of the Major Arcana, Emergence (pictured here). 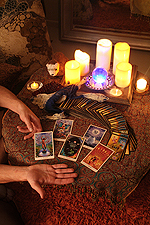 So if you are drawn to seeing what can be learned and what kind of doors can open to you by listening to me read the cards you select from this deck, please give me a call and book a session. On my 40th birthday, on the cusp of some very major life decisions, Jallen gifted me a tarot reading. Throughout the upheavals that occurred in my life later in the year, I have come back to that reading again and again as a touchstone of hope and love for the future. His gentle intuitive presentation made each card and position clear and let me fit my own intuition with his to find profound focus and meaning. I took a picture of the spread and every once in a while when I need some encouragement to keep moving forward, I look at it and see the capacity for infinite adventure that life will bring. And I am grateful. "From the moment I started reading Jallen's book, "Ex Gay, No Way", I knew I had to reach out to him somehow. I was so grateful that such a book existed! I hoped that he would be able to help join my sexuality with my spirituality, and he has done that and more! He is such a wise, supportive person and his presence immediately put me at eas e. Through our sessions, I have gained confidence in myself and have found a sense of wholeness that I didn't know could exist."